Are you searching for the best golf clubs for seniors? Look no further, the following comprehensive review will delve into what is important while looking for clubs. In addition, we will present the top 5 clubs on the market for seniors. As a quick comparison, these are the best golf clubs for seniors. Golf is a game for those of all ages and both men and women. For seniors it is a great way to maintain a healthy lifestyle and keep the mind and body active. Custom equipment has been designed to account for the growing popularity with seniors and golf. 3 Specification Options for Custom Fitting: Men's Standard RH: 5'5" to 6'1", Men's Standard LH: 5'5" to 6'1", Men's Tall RH: 6'1" to 6'5"
The Wilson Men’s Golf set has been designed with comfort and efficiency in mind. Seniors will benefit from the larger and increased grip. With a 460cc forged titanium composite driver the extra volume will increase your distance through the increased sweet spot. The fairway wood has a lower placed weighting which makes playing from the rough easier. The shaft offers incredible flex and durability. Irons are manufactured with stainless steel and feature a large sweet spot making the irons very forgiving. The additional feature of a deep cavity on the irons have been used to increase accuracy while golfing. Sand and pitching wedge designed to improve performance and playability and an easy to align and use putter. 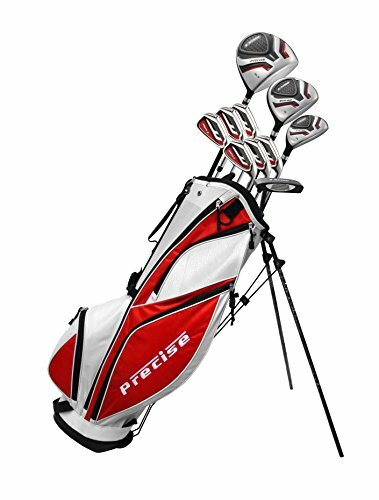 The set is available for both left and right hand golfers and includes a stylish, comfortable and durable carry bag. Overall the lightweight shafts make the Wilson Men’s Golf set great for senior golfers. If you aren’t a power hitter but are searching for clubs that connect your shots almost every time these clubs are a great set. Hybrids are extremely forgiving clubs and if you struggle with standard irons, the Mens Majek set will improve your golf significantly. The clubs offer senior flex velocity and the shafts are manufactured from graphite making them very lightweight. They have been designed with maximum forgiveness in mind without compromising accuracy or distance. The weight has been positioned in the cavity of the heads in such a way that the accuracy is enhanced. With a larger sweet spot and higher loft you’ll be driving great distances. We have noted a small issue with the clubs in which the enamel covering on the hybrids wears after prolonged use. Overall theMens Majek set looks good and performs well. Designed with the senior golfer in mind these lightweight, durable clubs are fantastic set. The Tour Egde Mens golf set is great for senior golfers. The set comprises of a driver, 3-wood, 5-wood, 4 hybrid, 5- SW irons, putter and a lightweight bag. The driver is a 460cc titanium matrix driver with a 10.5 degree loft. In addition to this the weight has been placed in the heel and toe of the sole. The thin face improves the forgiveness and the enlarged sweet spot allows for more connection and distance. Without the long irons the HP25 hybrid boasts a stainless steel head and low profile which is is going to increase the ease of making shots. 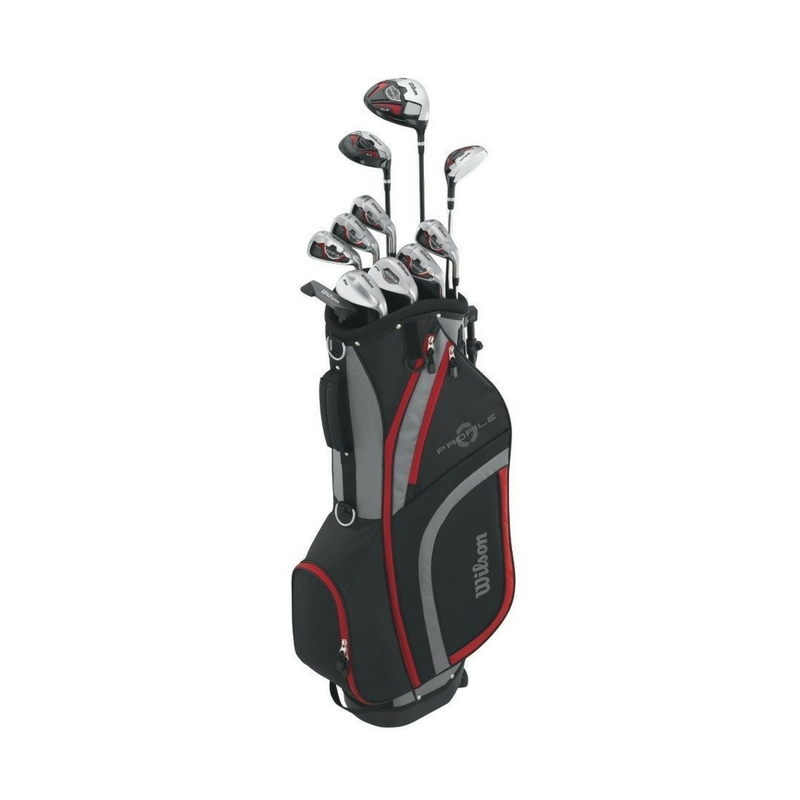 Great clubs for seniors and beginners alike, the Tour Egde Mens golf set is made from lightweight material and larger sweet spots will have you performing well in no time. Through research and reviews we know that for senior women in the sport, the iron set proves to be the biggest difficulty. The Majek Senior Lady Hybrid set is fantastic for those looking for distance without compromising control. Benefits of these clubs include: a tighter shot dispersion which will correct slightly off centre hits as well as drag reduction thanks to the aerodynamic design. Featuring Senior Lady Flex Velocity Graphite shafts you will be able to achieve a greater distance with your swing speed. Black crown and arrow markers make alignment easier and in addition the entire set can be custom made to suit your height. With good quality reviews it is hard to overlook the Majek Senior Lady Hybrid set for senior ladies. 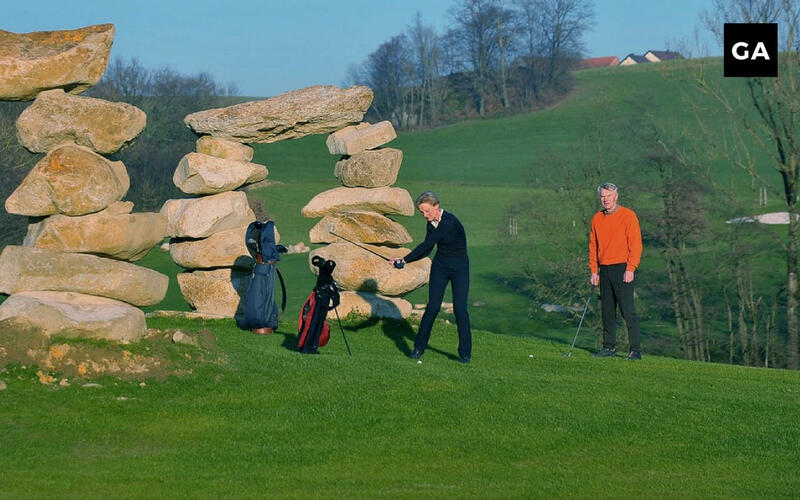 Adams are quite renowned in the golfing industry for beginners, seniors and professionals. For senior players the Adams Golf Blue Combo clubs are great game improvement clubs. Made from graphite the irons are great for increasing your swing speed. The lightweight design allows for increased swing without loosing accuracy. 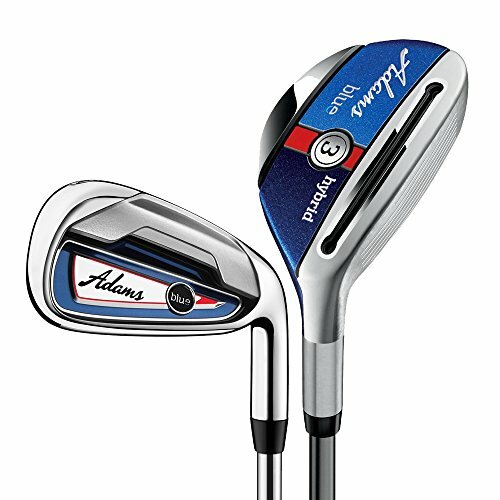 The Adams Golf Blue Combo clubs are very forgiving and seniors will benefit greatly from these clubs. You may even notice a reduced handicap. The only complaint with these clubs is that they are a little long, if you are short be sure to measure these clubs against yourself first. Taylormade’s latest and greatest set of irons and hybrids offers golfers unmatched playability and forgiveness. Only hybrids and irons are included in this set so if you will need to get a driver, putter, bag, and extra wedges to complete the set. The two included hybrids are equivalent to a 4 and 5 iron and feature a speed pocket design to increase clubhead speed. These hybrids are perfect for senior players since they allow for more distance than a traditional iron. All the included irons (6-PW) are feature packed and include cutting edge technology such as Speed Bridge Technology and a Fluted Hosel. 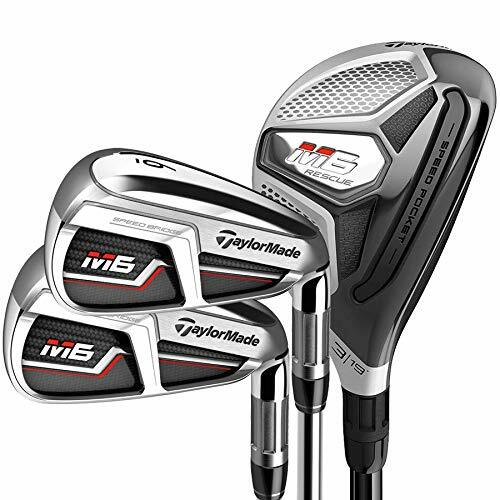 It is because of these features that the Taylormade M6 irons have the best feel of all golf irons on the market today. An added plus for senior golfers is the inclusion of a lightweight graphite shaft on the irons and hybrids to help increase swing speed. Price is the biggest drawback with this set, and this is due to the amount of technology included. 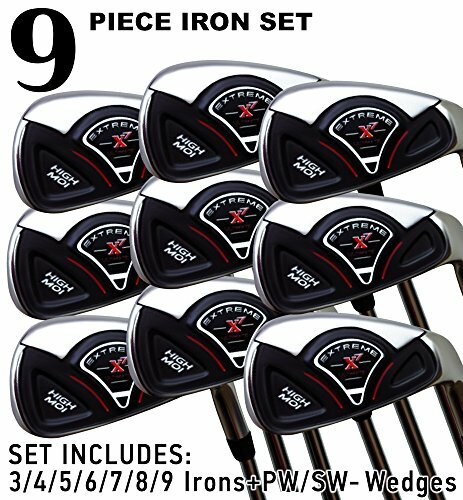 If other items were included in the set the price may be a little more justified but with just the hybrids and irons, it is one of the more expensive golf sets available. Full Titanium Adjustable Driver: The fully adjustable 460cc titanium driver has 3 different face angle settings so golfers can personalize their ball flight path. The draw setting promotes slice reduction and a right-to-left ball flight, while the fade setting promotes a hook reduction and a left-to-right ball flight. The neutral setting has a square face angle with a straight ball flight. Oversized Woods: 3 & 5 stainless fairway woods with graphite shafts and low profile design help get the ball up in the air from tight lies. Graphite Shafted Hybrid Iron: 4 Hybrid with a graphite shaft has a lower center of gravity for high ball launch and ultimate forgiveness. Stainless Wide Sole Irons: 5 through pitching wedge irons with an undercut, wide sole design push the center of gravity low to maximize forgiveness and produce longer shots. Top Flite is one of the best in the industry when it comes to premade golf sets. Their sets come with everything you need to hit the links and usually at a price that makes sense. Included is a 460cc Titanium Driver that can adjust to 3 different face angles so you can customize your ball flight to fit your own personal style. Two oversized fairway woods and one hybrid make up the long clubs of the set. Each has a graphite shaft and a low profile to help golfers hit better shots from tougher lies. The Stainless Steel irons in this set were designed to have a wide sole and a low center of gravity to help increase forgiveness and promote higher launch angles. Small speed pockets are also near the leading edge of the club to promote better aerodynamics. Lightweight graphite shafts that feature a senior-friendly flex are installed in the irons. A wedge that is made from 431 Stainless Steel, as well as a blade style putter, is also included. 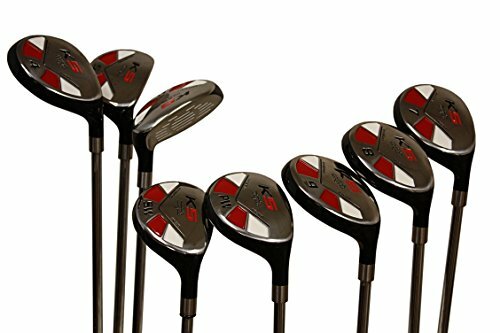 Sadly, the Top Flite Senior Men’s Tour Complete Set is only available to right-handed golfers but for you righties, this set has some of the best golf clubs for seniors. For those that have a hard time hitting irons consistently, a change to hybrid clubs may help improve your game. Many club manufacturers now make hybrid style irons that replace traditional blade style irons. The iDrive Senior Ladies Hybrid Set is comprised of eight total clubs that range from 3 iron to pitching wedge. Each of the clubheads is oversized yet still maintains a low profile for easier shot alignment and forgiveness. This set of hybrids really has great distance and even the wedge can provide much more distance than a comparable traditional style wedge. 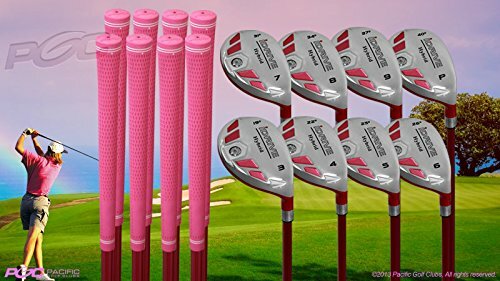 Pink is the color of choice for this set of clubs with all the clubs having a bright pink grip and a deeper pink graphite shaft. No bag or other essential clubs are included, so you will need to have, or purchase, the additional clubs and bag. Built with quality that is meant to last, the iDrive Senior Ladies Hybrid Set are some of the best senior golf clubs available. So if you are having a hard time hitting traditional irons, go ahead and give these hybrids a try! You won’t regret it! Seniors who are looking for a full set of clubs that bring a mix of value and quality should look no further than the Tour Edge Bazooka 360 Set! 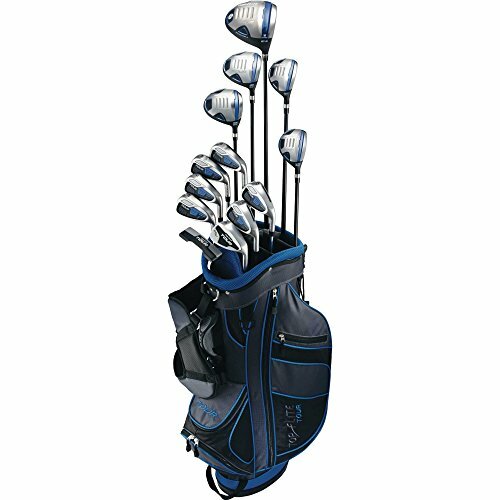 Each set contains twelve premium quality clubs and a bag at a great price. It is no secret that the driver, 3 wood, and 5 wood included in this set are all about distance. The driver is a 460cc Titanium matrix design that also features a middle of the road 11.5 degrees of loft. Similarly, both woods are oversized while still maintaining a low profile. All three of these clubs are made to help you increase distance from the tee and fairway. 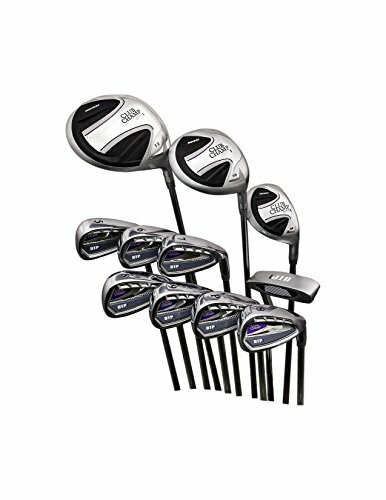 A 4 hybrid along with irons that range from 5 to Sand Wedge are also included with the set. Each iron is of a cavity back design that lends itself to greater forgiveness and easier launches. The hybrid is a standard hybrid design with a tank that is just slightly longer than normal. All clubs come with a graphite shaft to help lower the overall weight of each club and help create more swing speed. Both right and left-hand orientations are available for purchase. The included bag does come with shoulder carrying straps but does not come with stand legs. So if you plan on walking the course, it could be hard to find flat enough ground for the bag to stand by itself. Hybrid irons have become increasingly popular among senior golfers in the past several years as the design allows for more distance and forgiveness. One set of premium hybrid irons is the Extreme X7 Senior Men’s Set. In this set, nine clubs (3 – SW) are included. Many features combine to create one of the best hybrid golf club sets for seniors. A hollow core 2-piece construction distributes weight closer to the sole which creates a better center of gravity. Perimeter weighting can also be found on the shorter irons and allows for more feel and forgiveness on shots closer to the green. Each clubhead is also offset to promote a more closed clubhead at impact. Plus, an offset clubhead makes it easier to center the ball on address. A lightweight graphite shaft that has a senior flex is installed on all clubs in the set. Another little plus is the inclusion of an arthritic grip that is meant to reduce overall hand fatigue. 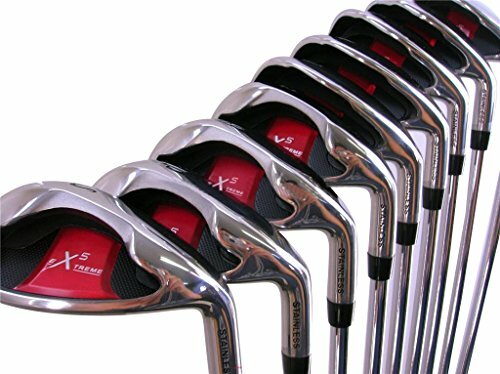 The Extreme X7 Senior Men’s Set is an irons only set which means no other essential clubs are included. Also, no bag is included so make sure that you have an extra bag to use if you plan on purchasing these excellent senior hybrid irons. 100% Graphite Shaft On Woods / 100% Graphite Shaft OR True Temper Steel Shafts on Irons! This set is also available in ALL GRAPHITE SHAFTS! All-graphite also available with senior flex shafts! Matching Deluxe Dual-Strap Golf Bag and Headcovers! Carry your bag like a backpack! Precise is a newer company has just recently decided to jump into the ring of golf club manufacturers. So far Precise’s offerings have been very impressive, with clubs sets that are made with quality materials and designs. This particular set, the Precise MDXII Men’s Complete Golf Set, is made for male golfers but comes in many different configurations. For this review, the senior flex with all graphite shafts was chosen. A 460cc Titanium Driver, 3 wood, 4 hybrid, 5 – PW irons, and a putter are included in this set. 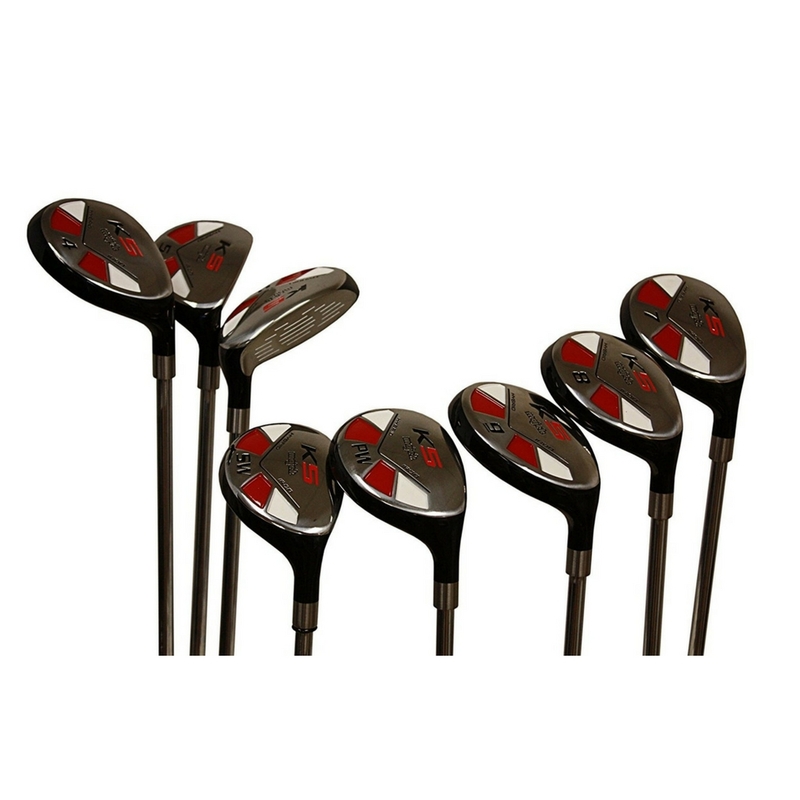 Each club head is made of stainless steel and has a pleasing white/red/black color scheme. This color scheme is also present on the included stand bag. The driver and woods have great distance and forgiveness. All of the irons are cavity backed and have great feel on all shot types. A small speed pocket found on the sole of the irons is also present. Interestingly, even the putter has a graphite shaft which is not all that common. Caution is recommended with the putter since it could be easy to break the shaft off at the hosel due to the offset. Other than using the putter with caution, the Precise MDXII is a great set for senior men who are looking for an easy way to gain more forgiveness and distance. Of all the sets included in this review, the Wilson SGI Women’s Golf Set is by far the best value complete set of senior golf clubs. A driver, 3 wood, and hybrid are the long clubs of the set. Each comes with a stainless steel and titanium clubhead construction. An aerodynamic sole design will help increase swing speed as well as improve turf interaction. The irons (6-SW) are cavity backed with the exclusion of the pitching and sand wedge. The cavity back is very simple with a very small undercut. A muscle back style is present on the pitching and sand wedge, which is meant to help with feel and spin on shots that are around the green. The included bag is a lightweight carry bag that also includes a backpack style shoulder strap. 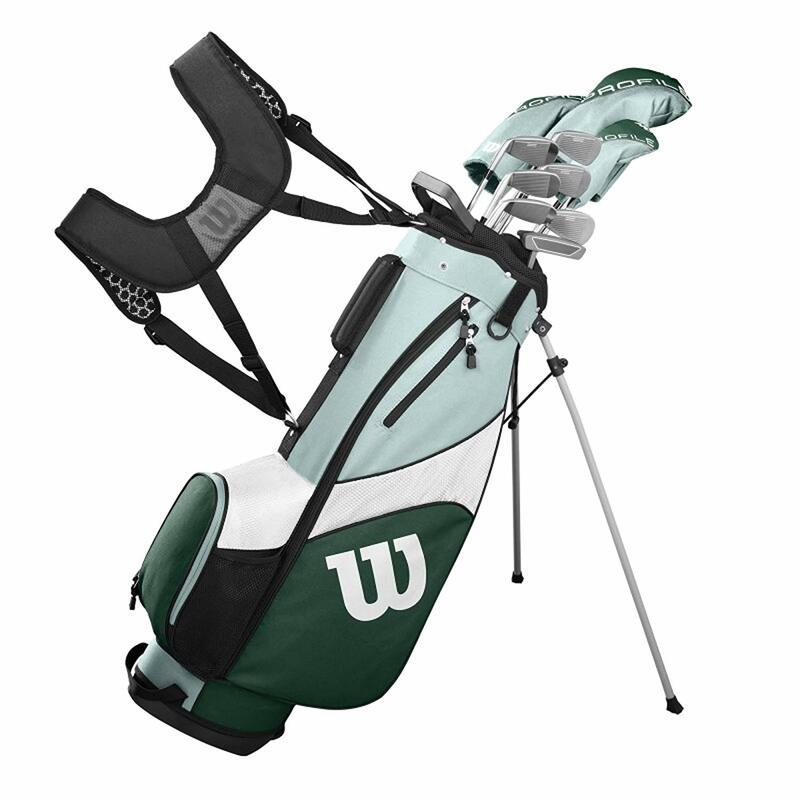 A color scheme of white/green/teal is present on the bag and clubs. Several different lengths of clubs are available to help accommodate those that are taller or shorter than average. Most women will fall between the standard size height of 5 feet 3 inches to 5 feet 9 inches. Overall, Wilson creates the best value golf set by combining excellent clubs with a great bag. If you are looking for the perfect set of ladies senior clubs, look no further than the Wilson SGI Women’s Golf Set. You won’t be disappointed! 100% Graphite Shaft On Woods & Irons! A Flex shafts are 40% Lighter than steel shafts! Our specially designed A flex shafts are more flexible and easier to swing! 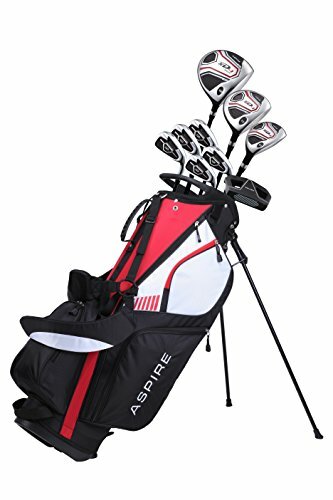 The Aspire XD1 Senior Men’s Complete Set is a fantastic set for senior players that are new to golf or who want a set that has just a couple fewer clubs than what is offered in other golf sets. Like many other sets, a large 460cc titanium driver is included and complemented by a stainless steel 3 wood and 4 hybrid. A 3D patterned sole helps all three clubs achieve low drag and smooth turf interaction. The irons included in the set are very simple in design but get the job done without much issue. Judging by the thicker edges, the irons are premier weighted to help create better balance and stability. This is a plus for anyone who has a hard time closing the clubface right before impact. A mallet style putter is included and is somewhat of an unusual choice since many sets like to go with a simpler blade style putter. This is a plus for golfers who like a larger more stable putter. All the woods and irons in the set come with graphite shafts that are over 40% lighter than their steel counterparts. That large of a difference is something that can be truly felt and will be key to generating faster swing speeds. A lightweight red/white/black carry bag with a backpack style shoulder strap is included with the set. Many similarities can be found between the Extreme X5 Senior Men’s Iron Set and its bigger brother the X7 Iron Set. The first similarity is that just like the X7, the X5 Iron Set is only made up of hybrid style irons. Eight total irons are included and range from 4 iron through sand wedge. Instead of being a closed back style of hybrid, the X5 Iron Set has a large open cavity back with an insert that is supposed to increase forgiveness and move the center of gravity lower in the clubface. Some versatility is lost due to just how large the sole of the club is, which may make certain types of shots much harder. Even the sand wedge has a large sole which could make opening the club face for deep bunker shots very difficult. The premium arthritic grip that is included on the X7 set also makes an appearance on the X5. It seems that this grip is a little more padded and slightly larger to reduce the stress on one’s hands during the swing. Graphite shafts are still included and look to be the same shafts that are in the more expensive X7 set. And just like the X7 set, several important pieces are missing from this hybrid iron set. A bag, putter, and driver are not included and must be purchased separately. Perfect for beginners or players who want no-nonsense clubs, the Club Champ Ladies Complete Set comes with 11 clubs to help make you a more consistent player. A large, 13-degree driver is the cornerstone of this set and comes with a design to help maximize distance off the tee. A silver and metallic-speck paint job makes the driver look flashy but without directly stranding out. Also included are a 3 wood and 5 hybrid and just like the driver, they create great distance and forgiveness. All of the woods have a matching paint job that is the same as what appears on the driver. The included irons are of premium quality and feature a traditional cavity back design with slight undercuts on the back of the club. Just like the woods, the irons come with a low-torque graphite shaft installed to help improve overall swing speed. Blade putters are very popular and the Club Champ Ladies Complete Set does include a blade putter with tru-roll face treatment. 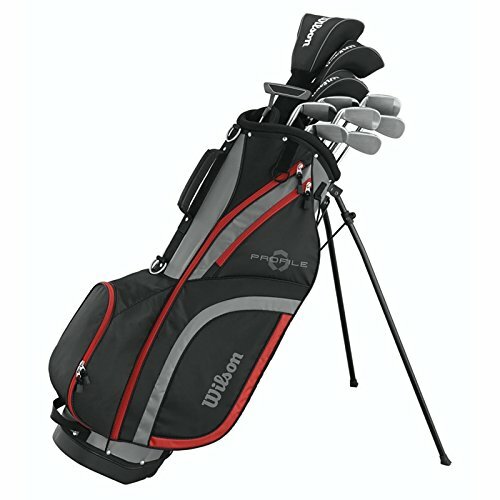 What is missing from this set is a bag to carry all these clubs in but at the low price of just $200, there is more than enough room to pick up a quality carry or cart bag. For seniors, the first factor when choosing clubs is the ability to drive greater distances with reduced effort. How is this achieved? When selecting a driver you will need a club face with a big centre area. The shaft of the club also needs to be made of a flexible iron composite. The shaft will affect the swing speed- the flexibility will account for the reduction in swing speed over time. The best golf clubs for seniors are hybrid sets. Generally, for seniors, the sets will be designed with both wood and iron, increasing distance at a reduced effort. For most players, a 3 wood combination and wedges is recommended. For seniors, however, we recommend adding loft to the three wood and driver. The shaft of the golf clubs play an extremely important part in the enhancement of your golf game. This is essentially the engine of your clubs and is quite often overlooked when selecting clubs. The shaft flex, torque, weight and alignment are key for an optimal golfing performance. The shaft flex is the ability for the shaft to bend during a golf swing. The flex will affect the direction and distance and all shafts will exhibit flex while swinging. Take for example a player with a very fast swing would be better suited to a shaft with less flex. Lucky for seniors, there are clubs designed exactly for your needs- your flex rating is S (Senior). This refers to the twisting movement that occurs when swinging your clubs. It is measured in degrees and presented as a rating. The lower the rating the less the shaft twists. Let’s take for example a shaft with a 3 degree torque versus a shaft with a 5 degree torque. The 3 degree torque is going to feel a lot stiffer than the 5 degree one. In terms of your golf performance, the torque will effect the ball trajectory. A lower torque results in a lower trajectory and vice versa. In terms of shafts the weight refers to the raw, uncut shaft before it is installed. This is always in grams and as a general rule the lighter total weight the additional speed and therefore distance can be achieved. Taking this into consideration, for seniors we recommend shafts weighing no more than 60grams. With the latest manufacturing technology it is possible to find shafts around the 50gram weight. As advised by senior golf players, it is important that the grip-end of the club weights more than the lower end. A longer shaft allows for more speed in your swing. They key here is to choose a driver that consistently provides a solid hit. We highlight our top 4 selections for the best golf clubs for seniors but it must be said that a customized set will provide maximum strength. For senior players, to find clubs best suited for your capacities is the most important factor. There is always the option of going into a golf store and getting a feel for the clubs before making your purchase. There is nothing worse than having ill suited equipment to golf with. Having said that we have researched the top golf clubs for seniors and provided a thorough review. Taking into consideration what was mentioned for selection and from your own experience, we hope you can make a well informed decision on your purchase. Here is a great video about golf tips for seniors. Whether you are a senior golfer that has been golfing all your life or someone who is thinking about starting, our club recommendations can help you choose the best performing clubs on the market. Sometimes senior golfers feel that as they age they will lose distance due to slower swing speeds. This is true, but with the right equipment, one can continue to get great distance and feel. That is why it is so important to know that there are golf sets that are made to specifically address issues such as slowing swing speeds. Golf is a wonderful sport that can be played by anyone at any age and is a great sport that many more seniors should take up. One of the biggest benefits is exercise, but other benefits like socialization and problem solving are something that makes the game great. No one should miss out on these benefits just because they feel that they can no longer play the way they used to. If you are having a hard time hitting your current clubs, take a look at the benefits of using senior clubs. All the golf club sets in this review are perfect for seniors looking to add more distance and consistency to their game. All it might take is a change to a new set of senior-specific clubs to bring your game back to what it once was. Golf is one of the few sports than can be played at the same level throughout your life. If you swing starts to slow or your accuracy drops, all you need to do is adjust your equipment. There are many sets out there specifically for seniors so have a look through the sets listed and take your pick!